As our only Atlantic Ocean destination, this trip offers a truly unique experience on the SwimTrek calendar. Including dramatic cliff swims, a spectacular hike down the Masca Gorge and personalised coaching sessions in a world-class training facility, this trip includes a fantastic mix of activities over the course of the week. 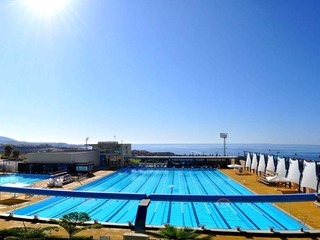 Your sessions at the state-of-the-art sports complex, Tenerife Top Training (T3), includes swimming coaching and training tips in an open-air 50-metre pool, as well as comprehensive technique analysis using T3’s fantastic swimming flume. 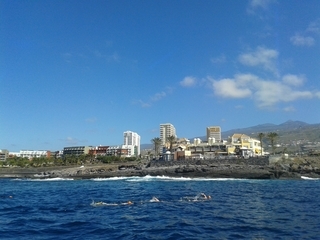 Based at the Hovima Jardin Caleta hotel in La Caleta, the trip’s open water swims take place in the relatively calm waters of Tenerife’s picturesque south-west coast, however the nature of ocean swimming means that water conditions can vary considerably from one day to the next. 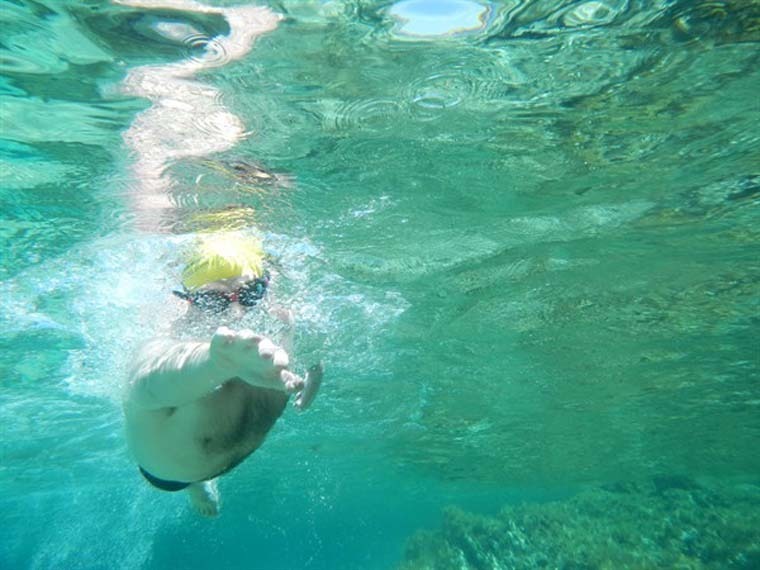 This trip is ideal for swimmers with some open water experience who are looking for a combination of activities to enjoy during their early or late season escape. 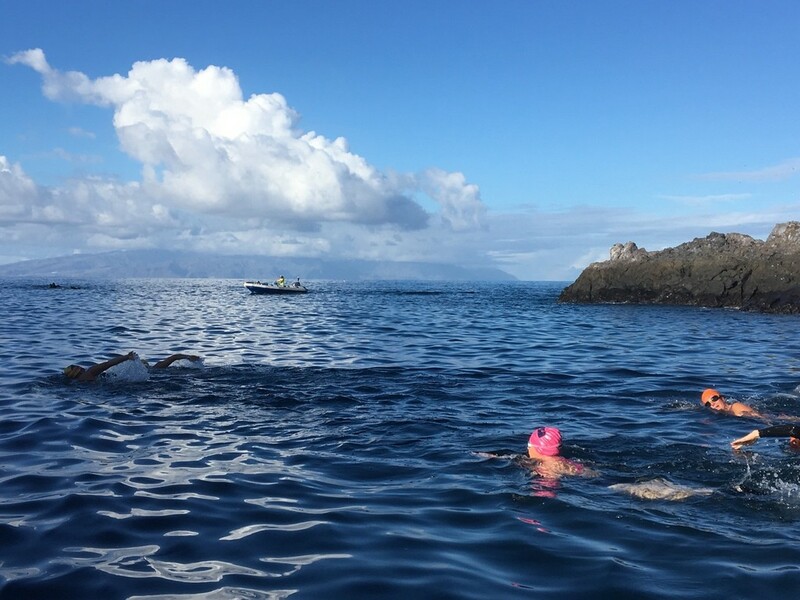 With coastal swims, pool sessions, technique video analysis in T3’s flume, and a challenging trek down the Masca Gorge, this trip offers something different and unique from other SwimTrek adventures. 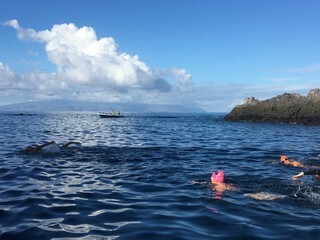 Swimmers should have a basic understanding of open water swimming and be capable of completing the average daily swim distance of around 5 km (split over a minimum of two swims) prior to the start of the trip. You are welcome to check into the hotel any time after 14:00 and relax before meeting up with your guide and fellow swimmers at 19:30. We meet in the grounds of Jardin Caleta where we hold a welcome meeting featuring a description of the days ahead followed by a safety briefing. After settling in, we will have the chance to get to know each other over a welcome dinner at the hotel. Up early for our short acclimatisation swim at a beach near the hotel. 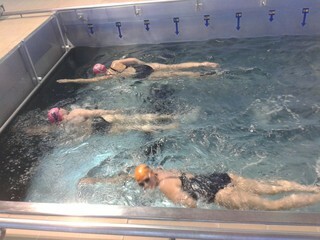 After breakfast, we head up to Tenerife Top Training for an open water skills and coaching session. This session is conducted by our expert open water swimming guides in order to prepare you for the week’s coastal swims. After lunch, we head off on a 3km cliff top walk to El Puertito, otherwise known as Turtle Bay. From here our coastal journey begins as we venture out from El Puertito and swim south, calling into the bays of Gaviotas and Blanca before we finish back in La Caleta. We travel further up the coast by shuttle bus to the lovely little village of Alcalá which has a number of interesting rock formations that you can swim out past. 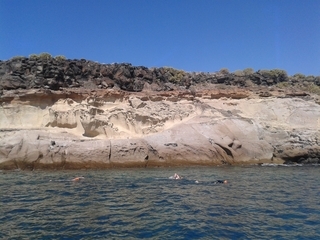 We swim south to Playa San Juan and enjoy a morning of captivating coastal swimming along this stark, volcanic coastline. Following our swim, we have lunch at Playa San Juan, before swimming south towards Playa Abama to enjoy another afternoon of stunning coastal swimming. After a short break on the beach, we swim back to Playa San Juan for our shuttle bus back to the hotel. 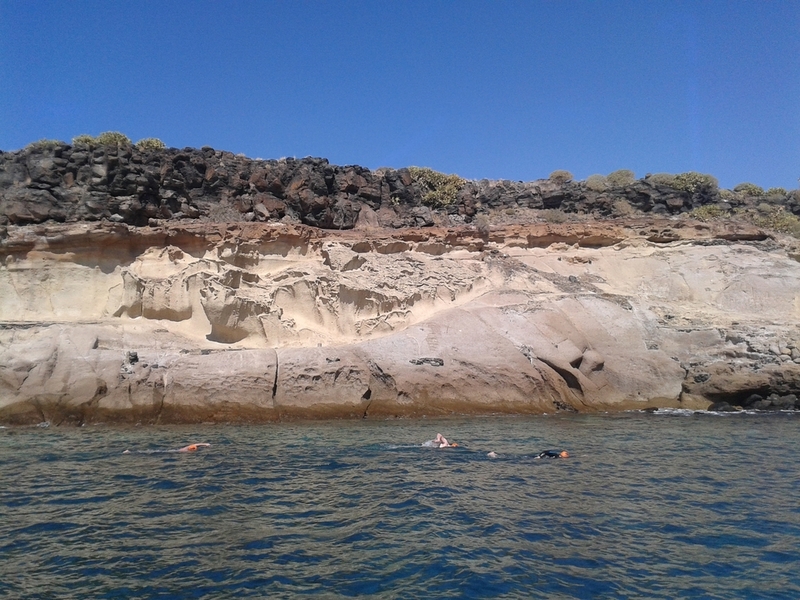 This morning we swim from Cala Savaje to El Puertito to explore another section of volcanic coastline. In the afternoon, we head to Tenerife Top Training for a technique analysis session in the facility’s state-of-the-art flume. The session is an excellent chance to pinpoint areas for improvement through the use of above and below water filming, video playback and a handy underwater viewing window. Our last full day and, undoubtedly, one of the highlights of the week. We travel by shuttle bus to the far north west corner of Tenerife and head up the mountains to the small town of Masca. We then join the beautiful Masca Gorge Trail and begin our descent down the gorge to the famous black, volcanic sands of Playa de Masca. Starting 600 meters above sea level, the challenging 5 km hike offers the opportunity to appreciate steep rock formations, stunning vegetation and plenty of local wildlife. Upon reaching Playa de Masca, we enjoy our well-earned packed lunch on this unique beach. 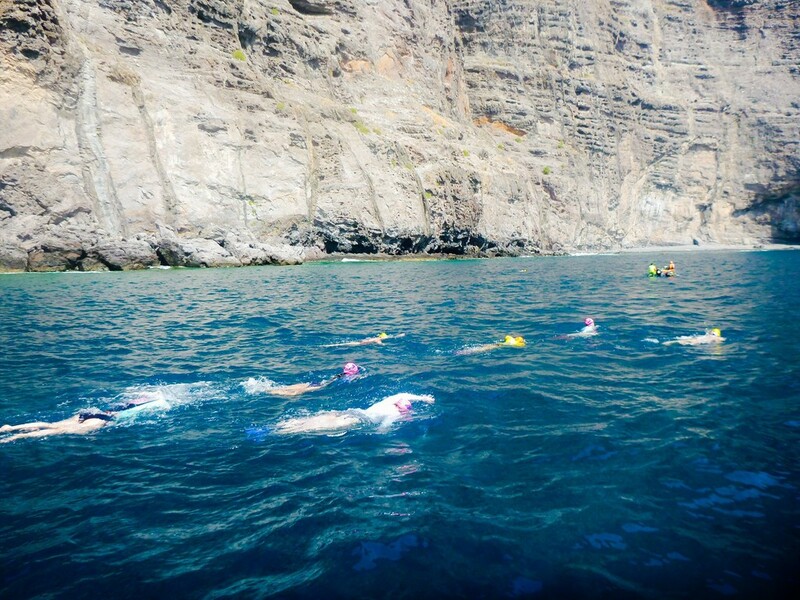 After resting up, it’s into the water to swim in the shadow of the sheer cliffs of the ‘Acantilados de Los Gigantes.’ The 4km swim back towards the town of Los Gigantes gives us plenty of time to enjoy the deep blue waters of the Atlantic Ocean. Following the exertions of yesterday, we take a relaxing morning swim in a bay near our hotel before the trip finishes at 11:00. **If you would like a copy of your video analysis, please ensure you bring along a USB memory stick. The Masca Gorge is a challenging 5 km hike and decent walking boots or shoes are recommended. The trail does not have any laid surface and can become tricky when wet. There are sections of the walk where you need to use both your hands and legs in order to descend. If you prefer to miss the Masca Gorge walk, you can catch the RIB (Rigid Inflatable Boat) to Playa de Masca and join us for the swim. Other walks during the week are on recognised paths and vary from 1-3km. *Please note that these temperatures are indicative and should be used as a guide only. Due to the nature of the Atlantic Ocean currents, water temperatures can vary significantly from one day to the next. Unlike other SwimTrek holidays, we do not use a main boat on this trip. Instead, we use Rigid Inflatable Boats (RIBs) to transport us to and from our swims, where required, and to provide safety cover. Please note that these RIBs do not have ladders to assist with getting on and off boat. 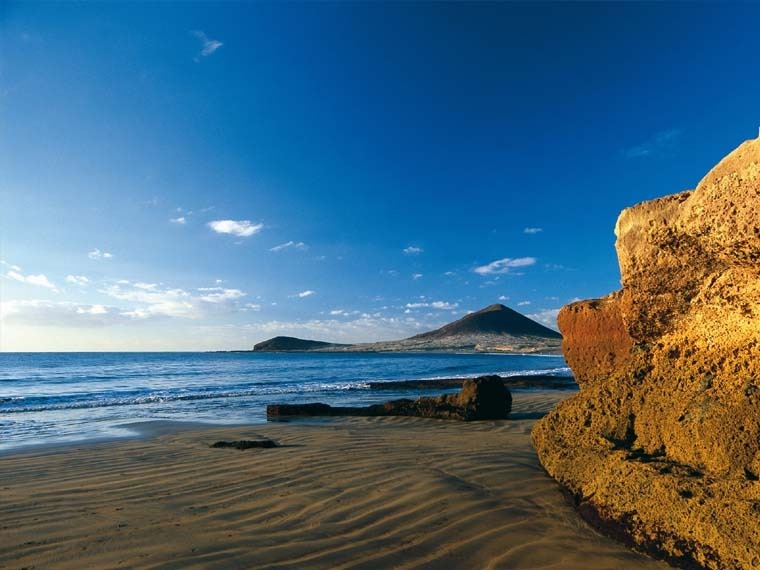 The easiest way to get to La Caleta at the start of your trip is to fly into Tenerife South Airport and then catch a either a shuttle or private transfer to the hotel. As you leave arrivals, the easiest way to travel to the hotel is either by shuttle or private transfer. Both services are available and can be booked using Resort Hoppa. The speedy shuttle service costs approximately £9 return and the journey takes around an hour, with four stops along the way. Alternatively a private transfer can be organised for approximately £50 return, for up to four guests, with the journey taking around 30 to 40 minutes to get to the hotel. If you wish to see a little more of the island and decide to take the bus to the hotel, you will need to catch the No. 111 from the Tenerife South Airport to Los Cristianos or Costa Adeje Bus Terminal (this is usually the end of the route but please check locally). The cost of this service is approximately €4. From here, you will need to take the No. 467 to La Caleta. This route has a stop directly outside the Hotel Jardin La Caleta and takes approximately 20 minutes, the cost of the journey is €2. Our accommodation for the duration of the trip is at Hovima Jardin Caleta, situated in the small fishing village of La Caleta. 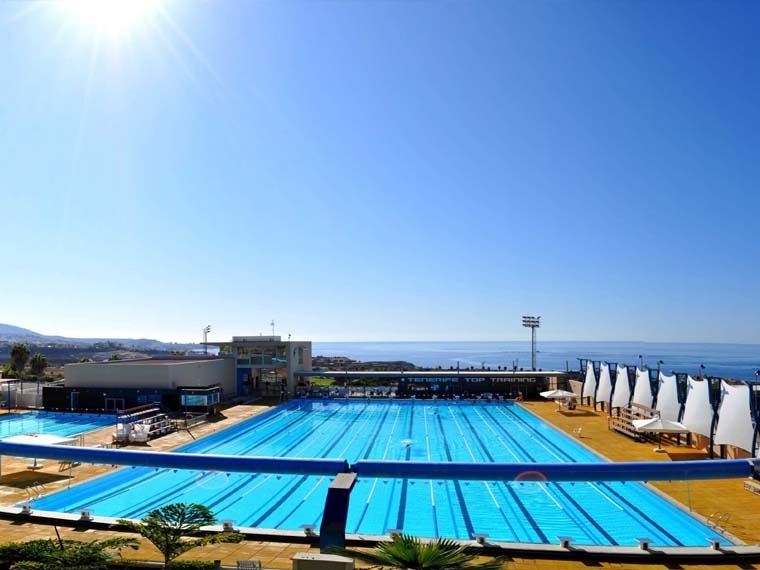 This 3-star hotel offers half-board accommodation and is located close to the waterfront and Tenerife Top Training Centre. Our accommodation is based on twin-share rooms with en suite facilities. It is possible to upgrade to an air-conditioned superior room with a side sea view during the booking process, subject to availability. There are also a limited number of single supplement rooms which can be reserved during the booking process, subject to availability. If you would like to extend your stay in Tenerife and need to book additional nights’ accommodation before or after your trip, please contact Tenerife Top Training on +34 922 782 933 or via email: heike@tenerifetoptraining.com. Please note the hotel is very popular during our trip dates, so we recommend booking your extra nights as early as possible in order to avoid availability issues. All breakfasts and buffet lunches at the hotel are included in your SwimTrek package. One dinner is also included on Day 1 of the trip. are at your own expense. All other evening meals are at your own expense, which gives you a fantastic opportunity to explore and experience the local cafes and restaurants of your choice over the course of your trip. You should bring extra money with you to cover items such as dinners, drinks, entertainment, souvenirs, etc. The local currency is the Euro (€). The average price of a two-course dinner in La Caleta is €15 - €20. The Canary Islands is part of Spain which is part of the European Union. Non-residents of Spain require a full passport to enter the country, which should be valid for six months beyond the expected length of stay. Citizens of most countries, including all E.U. member states, U.S., Canada, Australia and New Zealand do not require a visa to enter Spain. Please note that visa regulations are subject to change and we advise that you check your own visa requirements prior to travel. 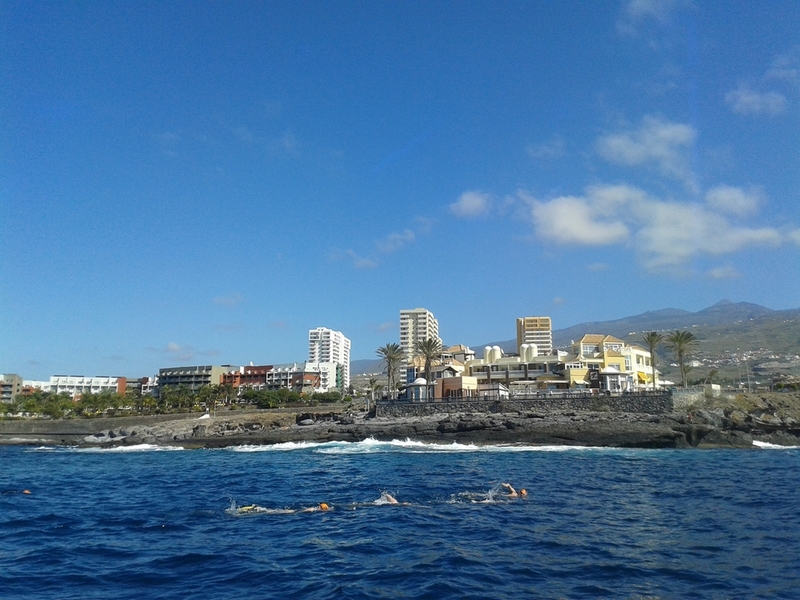 Tenerife Top Training Open Water Skills and Coaching Session. Had an amazing holiday. Far exceeded my expectations. Will be back with SwimTrek again next year! Tenerife’s volcanic coast was magical, and the guides are the best! The trip exceeded my expectations. Great swims, location, hikes, people and SwimTrek guides. Just the holiday I needed and did the world of good. I will have very happy memories of this trip. An amazing addictive experience, which recharges batteries and although exhausted am already looking for the next holiday. The guides make Swimtrek! Best vacation ever! I made many new friends, improved my swimming skills and had 100% fun! Thanks, Swim Trek!